Peroxisome proliferators include hypolipidemic drugs, herbicides, leukotriene antagonists, and plasticizers; this term arises because they induce an increase in the size and number of peroxisomes. Peroxisomes are subcellular organelles found in plants and animals that contain enzymes for respiration and for cholesterol and lipid metabolism. The action of peroxisome proliferators is thought to be mediated via specific receptors, called PPARs, which belong to the steroid hormone receptor superfamily. PPARs affect the expression of target genes involved in cell proliferation, cell differentiation and in immune and inflammation responses. Three closely related subtypes (alpha, beta/delta, and gamma) have been identified. This gene encodes the subtype PPAR-alpha, which is a nuclear transcription factor. 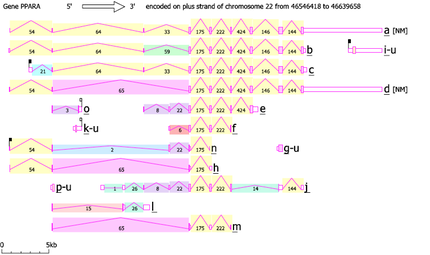 Multiple alternatively spliced transcript variants have been described for this gene, although the full-length nature of only two has been determined. There are 294 articles specifically referring to this gene in PubMed. Functionally, the gene has been tested for association to diseases (Arteriosclerosis; Body Weight; Breast Neoplasms; Cardiovascular Diseases; Cholesterol, HDL/blood*; Coronary Disease; Cystic fibrosis; Diabetes mellitus, type 2; Diabetic Angiopathies; Drug Toxicity and 15 others), proposed to participate in pathways (Adipocytokine signaling pathway, Basic mechanism of action of PPARa PPARb(d) and PPARg and effects on gene expression, Mechanism of Gene Regulation by Peroxisome Proliferators via PPARa(alpha), PPAR signaling pathway, Regulation of PGC-1a, Toll-Like Receptor Pathway) and processes (epidermis development, lipoprotein metabolic process, negative regulation of appetite, negative regulation of blood pressure, positive regulation of fatty acid oxidation and 6 others). Proteins are expected to have molecular functions (ligand-regulated transcription factor activity, metal ion binding, protein domain specific binding, sequence-specific DNA binding and 3 others) and to localize in nucleus. Putative protein interactors have been described (AIP, AKAP13, CEP350, CHD9, DAP3, DUT, EP300, FABP1, GADD45A, GADD45B and 25 others). PPARα Reporter Cells are prepared using INDIGO’s proprietary CryoMite™ process. This cryo-preservation method yields high cell viability post-thaw, and provides the convenience of immediately dispensing healthy, division-competent reporter cells into assay plates. There is no need for intermediate spin-and-wash steps, viability determinations, or cell titer adjustments. The principle application of this assay product is in the screening of test samples to quantify functional activities, either agonist or antagonist, that they may exert against the peroxisome proliferator-activated receptor. This kit product is an all-inclusive assay system that includes, in addition to PPARα Reporter Cells, two optimized media for use during cell culture and (optionally) in diluting the test samples, a reference agonist, Luciferase Detection Reagent, a cell culture-ready assay plate, and a detailed protocol. The gene contains 20 distinct gt-ag introns. Transcription produces 16 different mRNAs, 12 alternatively spliced variants and 4 unspliced forms. There are 5 probable alternative promotors, 6 non overlapping alternative last exons and 2 validated alternative polyadenylation sites (see thediagram). The mRNAs appear to differ by truncation of the 5' end, truncation of the 3' end, presence or absence of 4 cassette exons, overlapping exons with different boundaries. 2644 bp of this gene are antisense to spliced gene C22orf40, raising the possibility of regulated alternate expression.